Buy Natures Aid Complete Multi-Vitamins & Minerals - 90 tablets in the UK from our online shop or directly from our independent Scottish store. Complete Multi-Vitamins & Minerals. Free From Artificial Flavours, Colours & Preservatives, Lactose, Yeast & Gluten. Suitable for Vegetarians. Natures Aid Complete Multi-vitamins and Minerals are Free From Artificial Flavours, Colours & Preservatives, Lactose, Yeast & Gluten and suitable for Vegetarians. Take one tablet daily with a meal. Do not exceed the recommended intake. As official Natures Aid stockist, we sell genuine Multi-vitamins directly from our shop in Scotland and online throughout the UK. Where can you buy real Complete Multi-vitamins safely online? If you are wondering where you can buy Natures Aid Complete Multi-Vitamins & Minerals - 90 tablets safely online in the UK, then shop with us. We are an actual health foods shop; with real people selling real foods and products. Our award-winning independent shop is located in Stirling, Scotland since 1976. You can buy our Natures Aid nutritional supplements and other genuine Multi-vitamins in store or safely place an order with us online or over the phone. 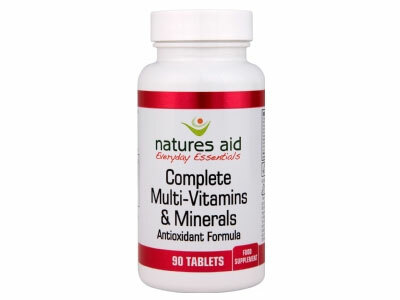 Complete Multi-vitamins - Natures Aid Complete Multi-Vitamins & Minerals - 90 tablets in Multi-vitamins and Vitamins and Minerals.